Police are searching for a man accused of sexually assaulting a teen in Berkeley. Roz Plater reports. 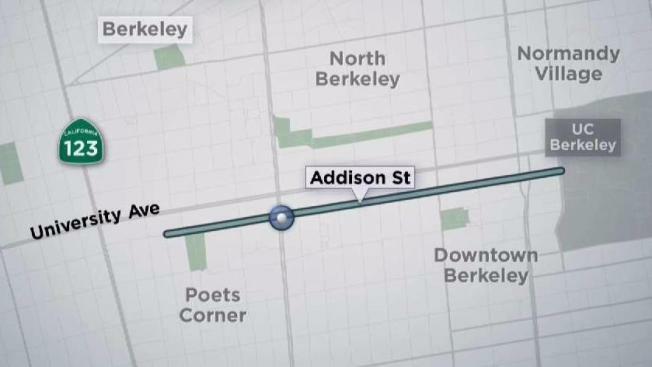 Police are searching for a man accused of sexually assaulting a teen in Berkeley. The incident was reported between 11 and 11:30 a.m. Thursday on the 1500 block of Addison Street. Police said the victim was walking when she was grabbed from behind. The victim said the suspect covered her mouth and pressed a gun into her side while telling her not to scream, according to police. The man then walked her eastbound on Addison Street and into a side yard of a residence, where he sexually assaulted her, police said. The suspect is described as a man in his 30s, standing 5 feet 7 inches tall, medium build. He was last seen wearing a black-hooded sweatshirt and blue jeans. Anyone with information should contact the Berkeley Police Department at 510-981-5716.